"My Point Park experience taught me how important collaboration and communication are to a creative production." Tell us about your current position with Universal’s Halloween Horror Nights. I moved to Florida last January to participate in the Disney College Program for six months. I fell in love with the area and the theme park environment, so I decided to look for a job in my field. 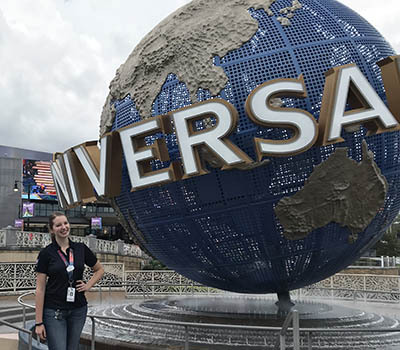 I found a posting for stage-managers at Universal Orlando fairly quickly; it was for Halloween Horror Nights, a popular yearly event. I always loved their parks and was encouraged by colleagues to take the next step. I submitted my resume, landed an interview, met with the wonderful production manager and was thrilled to receive a job offer. On my first day of training, I found out that I would assume the role of swing assistant stage-manager (ASM) along with two other managers. This meant that I would learn the tracks of all the ASM's and be prepared to cover for them. We have 10 houses, seven street zones and one show for Halloween Horror Nights – each has an ASM assigned. 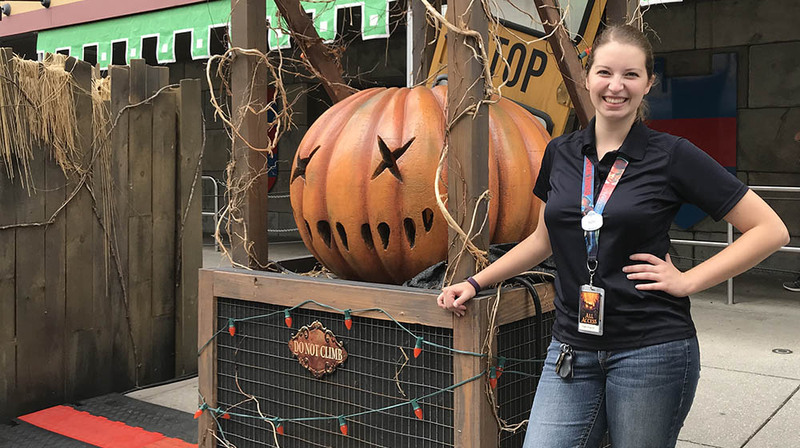 This person opens the house/zone every night, works with tech to make sure everything looks incredible, and monitors the actors for safety, as well as ensuring they do their job of scaring every guest who comes through their zone! It takes thousands of team members to put on the show, so the managers are there to help create perfection. What have you enjoyed most in your job? Being a swing allows me to meet/work with so many people and experience so many things. It's challenging to make sure you are available to cover multiple areas at any given time and remember your tracks, but it is well worth it! I have observed managing styles and learned firsthand what it means to be flexible. How did your Point Park experience prepare you for this challenging role? My Point Park experience taught me how important collaboration and communication are to a creative production. Also, my education in standard theatre helped teach to have respect and commitment towards the vision of the show. It may be in a theme park, but we are still aiming for a complete experience that guests can enter and get lost in during their stay. What advice do you have for students about the industry? Network, send out resumes and do not be afraid to take a leap of faith. Make that decision to move to a new location if it feels right. You never know who may have a connection or advice on a path to explore. Everyone is valuable and it really is a small community when you branch out of your comfort zone. Trust your gut, work hard and push yourself – it could change your life forever.